For a few bright heady years–-1913 to 1915–-the small East Bay town of Niles, about 20 miles south of Oakland, looked like it might offer Hollywood competition as the budding movie capital of the West. A sleepy agricultural town, it was awakened in 1869 when the transcontinental railroad arrived, surveyors having determined that scenic Niles Canyon afforded the best route through the East Bay Hills and into the San Francisco Bay Area. So it was 43 years later, in 1912, that Gilbert “Bronco Billy” Anderson stepped off that train, looked around, and liked what he saw. 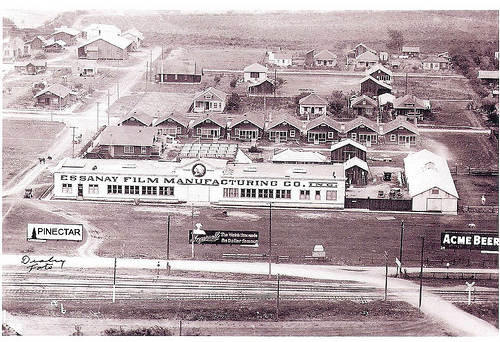 Niles, he decided, was the place to establish the western division of the Essanay Film Manufacturing Company of Chicago. This was no small decision. In Niles, Anderson would set the pace and define the Western genre for years to come. And it was in Niles that Charlie Chaplin would polish and perfect perhaps the most beloved figure of the cinematic twentieth century, his Little Tramp. Born Max Aronson in 1883 in Little Rock, Arkansas, of Jewish parents, Max wanted nothing to do with his father’s clothing business, yearning instead for a career on the stage. By the time he was a young man, he stood six feet tall, was solidly built, and had large, sure hands–wrangler’s hands. He seemed cut out for the role of heroic cowboy. Making his way north in 1902, he landed a job with the Edison Company in New York City where its studio was churning out short reels for the nickelodeons. Edwin S. Porter gave Anderson his first small role in a short called The Messenger Boy’s Mistake . A few years later, after convincing Porter he could ride a bronco–at the time he couldn’t even mount a sawhorse–he was hired for The Great Train Robbery . But Porter liked the young man and he played in the film a bandit, a fireman, and a passenger who, herded with other passengers outside the coach, breaks for freedom only to be shot down. Thus Anderson is purported to be first actor ever “shot dead” in a film. The movie was a stunning success, the first film to truly use the art of editing to advance its story, and moviegoers, thrilled by the locomotive and by all the horses and gunplay, returned over and over to see it. Perhaps not surprisingly, this first popular American narrative film was also a western–albeit one shot in the East, in New Jersey. Like all those who flocked to the film, Anderson was hooked. In those heady early days of filmmaking when everyone did everything, he learned as much as he could about the art, from acting and directing to writing and filming, producing and distributing. He left Edison to work with the Vitagraph Company in Manhattan, but the success of The Great Train Robbery stayed with him, and he began thinking about how to achieve a greater realism in the movies–which weren’t, like the theater, restricted by a proscenium arch and the shallow depth of the stage. Moviemakers could take their camera anywhere, like out into the middle of a stream; realism would be the new trump card. The United States was fast becoming a more industrial, urban society, and Westerns reminded many of what had been lost–the wide open spaces, the free movement of men and horses, new lands, which is what had beckoned Europeans in the first place. 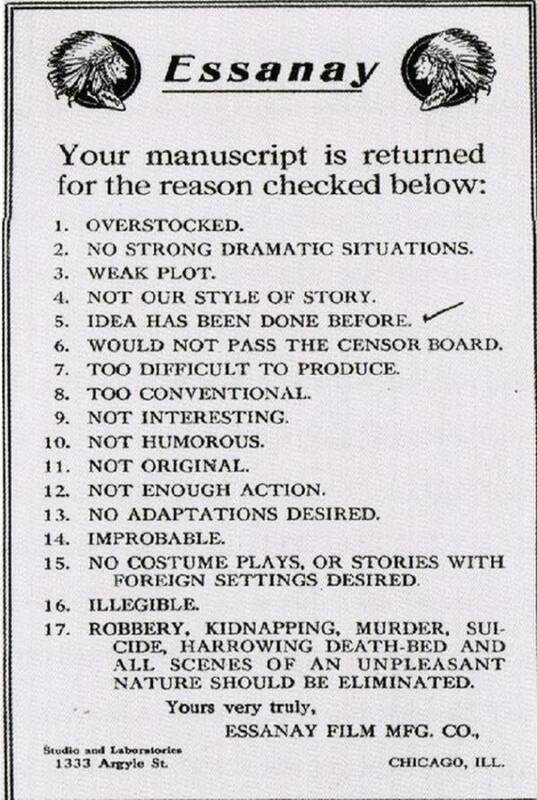 There were precedents of course: James Fenimore Cooper’s novels, pulp magazines, P.T. Barnum’s circus with trappers, buffalos, Indians. Indeed, the President from 1901 to 1907 was Theodore Roosevelt, who capitalized on his image as a cowboy, “the Rough Rider.” But it would be Anderson’s genius to be the first to exploit these concerns in cinema in a big, satisfying way. He traveled around the Rockies, convinced that the Eastern studios were missing a lot. Then in 1907 he struck a deal with George K. Spoor, a millionaire Chicago movie exhibitor and distributor who ran a chain of 122 nickelodeons in the Midwest. The brash young Anderson told Spoor he’d keep his theaters supplied with a steady flow of product in return for financing, and so the Essanay Film Manufacturing Company was born (Essanay or S & A–Spoor & Anderson). For several years he traveled around the West with a core group of actors and technicians, picking up some genuine cowboys along the way. As majestic as the Rockies were, they proved too cold to make movies year round, and so his group continued westwards, down to New Mexico, then on to Southern California. He wanted good rough Western scenery, looked at Los Angeles and didn’t like it. In Northern California they pitched their tent in San Rafael for the summer of 1911 before an East Bay movie exhibitor suggested to Anderson’s chief cameraman and location scout, Jess Robbins, that he check out Niles Canyon. With its rushing stream and steep ravines nestled among the wooded hills of the Diablo Range, it proved attractive, the upper canyon widening into meadowlands and fields. A dusty road even wound through the canyon, ideal for stagecoach robberies and galloping chase scenes. Still more wonderful, the railroad emerged from a hillside tunnel affording terrific opportunities for train hold-ups. Cabins dotted the woods and large ranches spread out through some of the back canyons, ideal for gold miners’ shacks, corral showdowns and range wars. And if they needed Mexican motifs Mission San Jose was in nearby Fremont, while the big towns of San Francisco and Oakland were handily close, both of which boasted professional theater communities. Then too, famous actors and musicians performed regularly at the open-air Greek Theater in nearby Berkeley, home of the University of California. As it turned out, Pleasanton, near the eastern end of Niles Canyon, was home to a dwindling tribe of native Digger Indians who lived in huts. Gentle folks, they had never laid hands on Alameda County settlers; and so they found employment as warring Indians in Anderson’s westerns. Essanay makeup people and advisors taught them how to daub on war paint, fling tomahawks, and let out ferocious war whoops. They had a ball. On April 6, 1912, the local paper, the Township-Register, trumpeted, “Essanay Firm with Fifty-two Employees Choose This Spot as Most Suitable for Pictures.” Niles had arrived and Anderson, already an international star and one of the main players in the century’s new art form, used the generated profits to build a studio at G and Main streets, a one-and-a-half story rectangular building that took up a whole block and dominated the center of town. Ten cottages were built behind the studio for employees and stars, and soon the Niles Essanay studio was considered state of the art on the West Coast. Anderson worked fast and his output was astonishing. These were the early days of one- and two-reelers, and he’d write his stories at night, rehearse his actors in the morning, and shoot the scenes that day. He made hundreds of pictures, mainly Westerns (about 375 Bronco Billy shorts, most of them shot in Niles), often in a day, and the camerawork was often amazing. 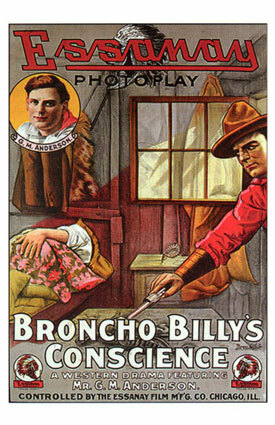 They had titles like The Ranger’s Bride , The Bandit’s Wife, and Bronco Billy and the Outlaw’s Mother . He became known as a pioneer of outdoor shooting, thanks to his cameraman, Robbins, and his assistant, Roland Totheroh, who became cameraman for most of Chaplin’s major films. Anderson’s westerns were corny but they moved fast, featured lots of shootouts, fistfights, and cowboy-and-Indian battles. They laid the foundation for William S. Hart, Tom Mix, and Buck Jones, for all that would follow. And they made Anderson one of the first movie millionaires and America’s first genuine movie star. Niles itself profited. Overnight sleepy Niles found itself on the cutting edge of 20th century popular culture. Besides Bronco Billy, Ben Turpin, Wallace Beery, Marie Dressler, Zasu Pitts, and Ethel Clayton all passed through. Ten bars thrived on Main Street. Cowboys galloped through town, six-shooters blazing. Covered wagons and stagecoaches careened through Niles Canyon. Then in 1914 for a great deal of money Anderson hired away from Mack Sennett at Keystone Studios a young comedian named Charlie Chaplin. He’d already made some 35 films for Keystone, including one feature, and was earning $100 a week plus bonuses. Anderson offered him an incredible $1,250 a week, with a $10,000 signing bonus. Plus he’d get to write and direct his own films. 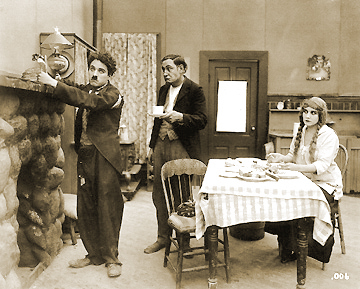 Soon, Chaplin was working on his first Niles film, the two-reeler A Night Out , which starred him and Ben Turpin as a couple of drunks, and a cute waitress he’d met in a San Francisco café, Edna Purviance, who would appear in his movies over the next eight years. She also shared his bed in one of the modest Essanay cottages on 2nd Street in Niles. 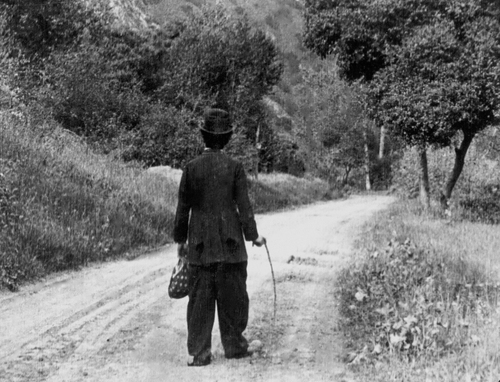 After that came The Champion followed by In the Park (shot either in Niles or in Golden Gate Park), and in these shorts Chaplin’s tramp character is still a pretty crude, rough fellow, using an unconscious enemy’s open mouth as an ashtray and the like. But the character was also being smoothed out, and many attributed this to Purviance’s influence. He was in love. In March he directed his fifth and last film in Niles and his first generally acknowledged classic, The Tramp . Shot on location in Niles Canyon, he introduced for the first time notes of pathos and melancholy to his comedy. Whereas Anderson knocked out his two-reelers in a couple of days, Chaplin labored hard over three weeks to complete his, rehearsing his actors over and over, cutting and re-cutting his footage. Released on April 11, The Tramp was a huge success; in it he plays a tramp who saves a farmer’s daughter (Purviance) from a gang of robbers. Shot in the leg, he’s nursed back to health by her but mistakes her kindness for love. Then her handsome sweetheart returns; he sees the writing on the wall and leaves. It is one of the most memorable departures in cinema. The Tramp leaves, walking sadly down the long and dusty road, alone once more, his hunched back to the camera, a small figure isolated in the Niles countryside. Then he shrugs, kicks his heels, swings his cane and continues on, a bit more jauntily and hopefully toward the horizon. The iris shrinks to encircle his receding figure,the image fades out. During his short three-month stay in Niles Chaplin’s popularity had exploded. He finished out his Essanay contract at a studio they built for him in Los Angeles, which he preferred, then accepted a far more lucrative contract at Mutual. During this period studios began making more four- and five-reel feature-length films. Among them were Thomas H. Ince’s westerns starring the former Shakespearean actor William S. Hart. Anderson saw what was happening, but his stingy Chicago partner Spoor did not. He believed they were doing just fine with the two-reelers. They weren’t. Chaplin’s star was rising fast and Anderson’s was sinking, attendance for his repetitive westerns dwindling. He spent more and more time partying in San Francisco, less and less time in Niles. Niles meanwhile continued to prosper. The population had doubled, there were new businesses. Then on February 16, 1916, in the middle of an afternoon shoot, a telegram arrived from Spoor in Chicago. He had pulled the plug. Everyone started packing and by the next morning the show was over. The studio that had made nearly 700 films stood deserted on Main Street, boarded up and padlocked, and the residents of Niles were stunned. Bereaved. Frustrated by Spoor, Anderson let him buy out his share of the company for $900,000, with the condition he not make any movies for two years. Which effectively killed Bronco Billy’s career. Bronco Billy was history. So was Niles. The studio, abandoned for years, was demolished in 1933. In 1956 Niles itself was incorporated into the city of Fremont. Yet even today it remains geographically separate, bounded by the Alameda Creek Flood Control Channel and by Route 238, and with its back up against the hills; and, if you listen carefully at night, you might still hear cowboys and Indians galloping down those slopes and coyotes howling high up on the hilltops. 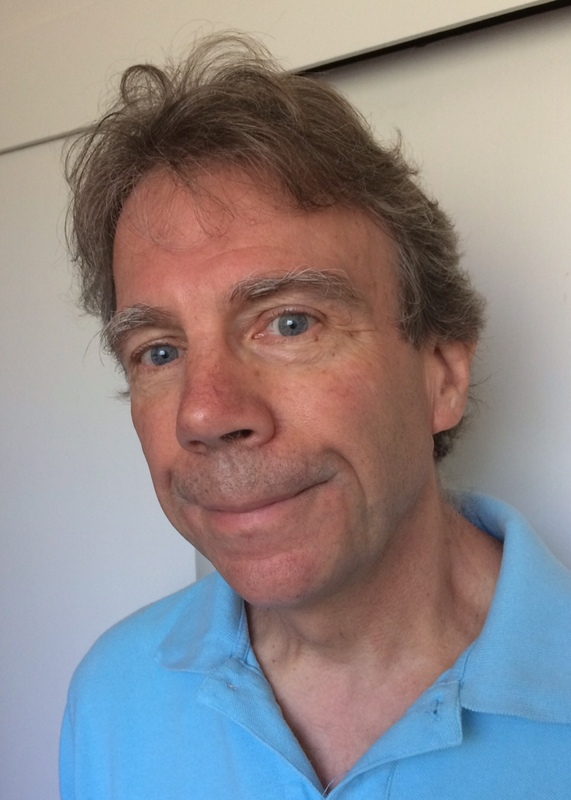 Michael Covino, an award-winning fiction writer, is the author of three books including the novel The Negative. He reviewed films for the East Bay Express for many years. Michael Covino’s story offers a fascinating history of a pioneering Bay Area movie studio that most people have never heard about. A terrific day trip to Niles will bring the history alive. Niles – a historic district in Fremont, California – is a delightful place to visit with its historic buildings, Niles Canyon Railway, museums, many antique shops and excellent restaurants. The Niles Silent Film Museum has a large and dangerously fun gift shop with everything you could want relating to classic movies. Plus there are great hiking trails nearby. 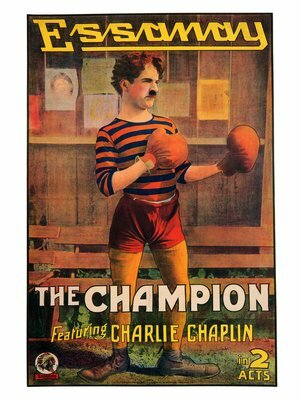 Chaplin’s restored Esssanay comedies are available on DVD and streaming on Amazon.com. This entry was posted in Films and tagged Charlie Chaplin, film history, Films, Niles, silent film. Bookmark the permalink.